With anti-money laundering and anti-bribery regulations becoming tougher and companies subject to increased scrutiny, it's important that your business has an effective screening and monitoring service to protect itself from 3rd party risks. BatchNameCheck is a secure, efficient and cost-effective solution for integrated name checking of current and new entities. With anti-money laundering and anti-bribery regulations becoming tougher and companies subject to increased scrutiny, it's important that your business has an effective screening and monitoring service to protect itself from 3rd party risks. BatchNameCheck enables ongoing batch screening of new and existing third parties, customers and other entities. 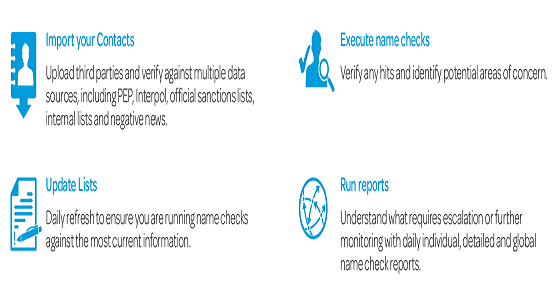 The solution automates the screening process against critical global watch lists, sanctions and PEP databases, as well as negative news. Whether ad-hoc or high volume company or person batch searches, BatchNameCheck gives you daily screening results and reports that help your identify and escalate entities that pose a potential risk to your organisation. By leveraging critical global watchlists, sanctions and PEP databases, as well as negative news searches, you receive near real-time results that give you the confidence you need to move your business forward. Quick to install and easily integrated with your own systems behind your firewall, BatchNameCheck comes with all the search, workflow and audit tools you need to efficiently manage the screening process. BatchNameCheck uses a proven, effective four-step methodology that allows you to screen high volumes of clients to service your due diligence research and entity monitoring. All four steps can be automated to further streamline your screening process.